Coach Saban starts out the SEC Media Teleconference this week with a special Happy Thanksgiving shout out to all who are listening, media fans alike. He said that he hopes everyone has a blessed Thanksgiving. He spoke on the Tide and the Tigers leading into the Iron Bowl. He did say that he is pleased with the focus of the Crimson Tide heading into the Iron Bowl. 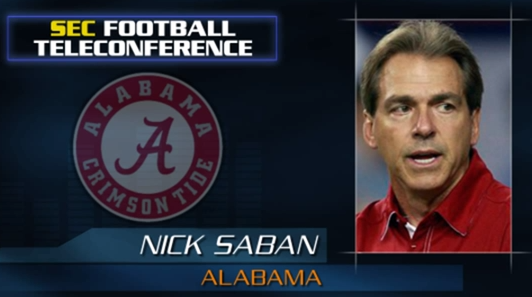 Saban said the Iron Bowl "is always a significant game and even more so this year." Saban on length spoke about the Gus Malzahn offense with its multiple formations, motions, adjustments, & groupings. He said it is isn't necessarily a normal spread offense where pass is featured, but is a run first offense that relies on the option to make plays. Against Auburn, he said that Alabama will try and keep the defense simple. The players will have to make the right reads & adjustments on the Auburn offense on Saturday. We know he will have Bama ready!